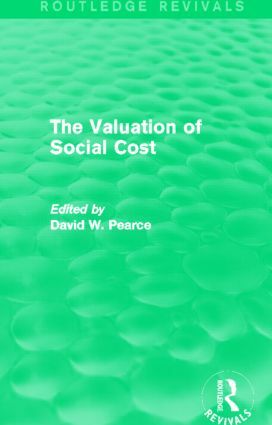 First published in 1978, The Valuation of Social Cost is concerned both with the idea, and with the practical problems, of placing monetary values on ‘intangible’, non-marketed goods, such as pollution, noise nuisance, personal injury, or the loss of home, neighbours or recreational benefit. A diverse range of contributors critically assess both the theoretical issues and the practical attempts made by economists and others to ‘monetise’ items which cannot be bought or sold. Each section contains a comprehensive literature review and a detailed critical appraisal. Despite being written in the late 70s, this book discusses issues which retain significant importance today.